Code to gradually reveal pictures from random uniform visual white noise. Image contrast (and thus signal-to-noise) increases linearly over time causing the image to gradually appear out of the noise. Brainard, D. H. (1997) The Psychophysics Toolbox, Spatial Vision 10:433-436. Pelli, D. G. (1997) The VideoToolbox software for visual psychophysics: Transforming numbers into movies, Spatial Vision 10:437-442. Kleiner M, Brainard D, Pelli D, 2007, “What’s new in Psychtoolbox-3?” Perception 36 ECVP Abstract Supplement. The EyelinkToolbox can be used to ceate eye-movement experiments and control the SR-Research Eyelink(c) gazetrackers (http://www.eyelinkinfo.com/) from within Matlab and Octave. It is incorporated into the PsychToolbox (http://www.psychtoolbox.org/). It provides an interface to the Eyelink Gazetracker. It uses a very similar approach as the PsychToolBox and uses the functions provided by the PsychToolBox for graphics and sound. We wrote our experiments in Matlab, using the Psychophysics and Eyelink Toolbox extensions (Brainard, 1997; Pelli, 1997; Cornelissen, Peters & Palmer, 2002; see http://psychtoolbox.org/. Brainard, D. H. (1997) The Psychophysics Toolbox, Spatial Vision 10:433-436. Cornelissen, F.W., Peters. E., Palmer, J. (2002). The Eyelink Toolbox: Eye tracking with MATLAB and the Psychophysics Toolbox. Behavior Research Methods, Instruments & Computers, 34, 613-617. The traditional way to study the properties of visual neurons is to measure their responses to visually presented stimuli. A second way to understand visual neurons is to characterize their responses in terms of activity elsewhere in the brain. Understanding the relationships between responses in distinct locations in the visual system is essential to clarify this network of cortical signaling pathways. 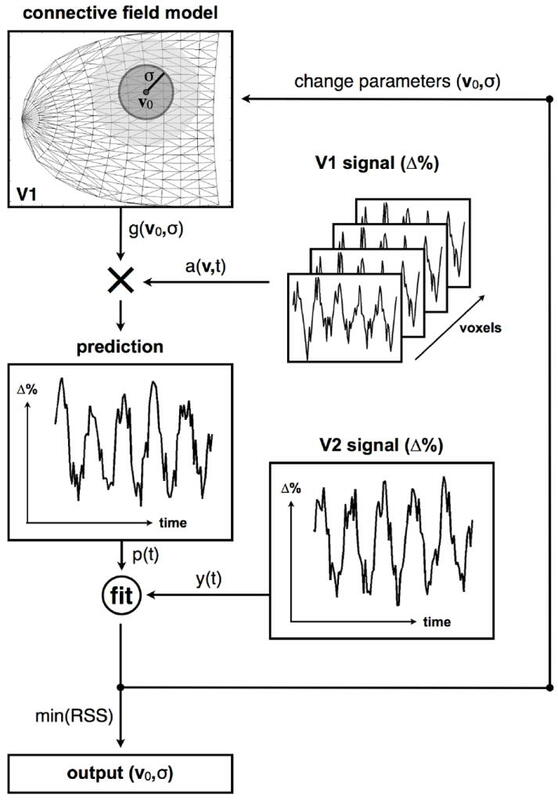 Here, we describe and validate connective field modeling, a model-based analysis for estimating the dependence between signals in distinct cortical regions using functional magnetic resonance imaging (fMRI). Just as the receptive field of a visual neuron predicts its response as a function of stimulus position, the connective field of a neuron predicts its response as a function of activity in another part of the brain. Connective field modeling opens up a wide range of research opportunities to study information processing in the visual system and other topographically organized cortices. (C) 2012 Elsevier Inc. All rights reserved. Connective field modeling is now integrated in mrVista, which can be found [here].